Want to add even more fun and realism to your home theatre? Add a pre-movie slideshow! It can be as simple or as elaborate as you want. Set the image viewer on your component to randomize a folder full of slides, create pre-formatted video slideshows using editing software on your computer, or go all out and and configure it down to the last detail with Cinema Experience for XBMC. Once you're set up you'll want some slides. They're easy to make yourself - which will allow you to personalize your theatre. And you can download them from other home theatre enthusiasts around the web. The ones I'm working on are listed below followed by a list of some created by others and posted at AVS Forum. Total slides so far: 397! Please note: All images, logos, etc... are copyright their respective owners. These slides are for personal home theatre use only and should not be sold or used in commercial settings. 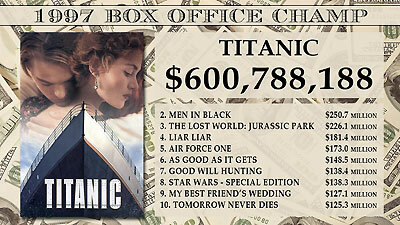 Using data from Box Office Mojo, one of the best movie reference websites out there, these slides show the box office champion for every year they have data for (1980 to the present). Also included on the slide is the rest of the top ten for each year and how much each film made in its initial domestic theatrical release. These simple slides feature the poster of the Oscar winner for Best Picture for every year since 1980. More will be added soon. 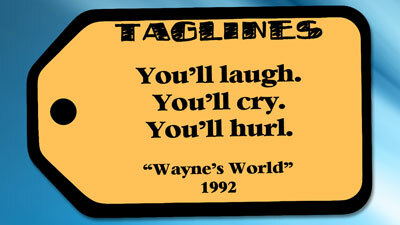 These slides, with pairs of question/answer images, will test whether you can name the movie by its promotional tagline. If you use a system that randomly picks slides, just use the answer images. Big hat tip to Tagline Guru for their list of the best! These new slides are some of my favorites to make. They feature the funniest lines from reviews of bad movies. I'll definitely be adding to this set! 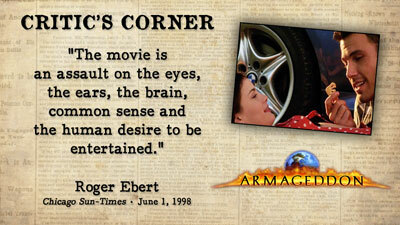 While everyone posts their favorite Ebert lines, quotes from other critics are harder to find. So feel free to forward any really good ones. If you've never heard of Rifftrax stop reading this and go to their website now! Then next time you hear they're doing a live show in theatres, you be there! You can thank me later! One of the best parts of a live Rifftrax show is their hilarious custom pre-movie slides. Thanks to some quick thinking audience members (especially this thorough guy), pictures of a lot of the slides are available on the web. These slides are lovingly recreated (read as "copied directly"!) from them. Obviously these are fan created and not officially from the folks at Rifftrax, who hopefully won't mind! In 2005, the American Film Institute selected the top 100 quotes in American film history - and eventually all will be featured on one of these slides! For those of you with question/answer slideshows, I also plan to make slides that just have the quote so your audience can guess the film before it is revealed. But until then, here are half of the hundred quotes ready to go. The design might change so be sure to re-download this set when the rest are ready. Major thanks to all the people online who have posted screencaps of these movies, without which this project would be impossible. Unfortunately not every movie has great shots easily available. If you see a bad one and can make a better version of it feel free to let me know! 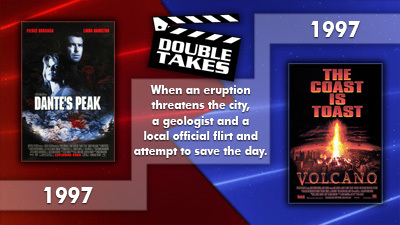 I was recently discussing with a friend the fact that occasionally two movies with very similar plots will come out in the same or back to back years. While it seemed to occur more often back in the 1990s, it's happened a few times in the past couple of years. Apparently my friend and I weren't the only ones to notice. Someone on Reddit posted a thread about the phenomenon and it received over 5,000 comments! This set immortalizes these Hollywood copycats! 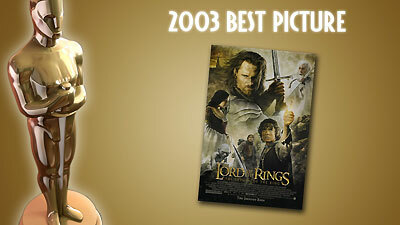 Slides that let you guess the two films are included for those who like to run trivia slideshows. 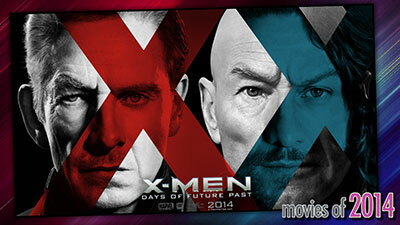 These slides highlight some of the big movies coming to theatres in 2014. • Pixar fun facts - Almost 200 slides with information on every Pixar release to date. • PBTrivia Volume 1 - 400 slides (200 questions / 200 answers) with trivia question from the early days of film to the present. Somewhere there is a volume 2 but I couldn't find the link while putting this list together. • Unofficial Coca-Cola ScreenPlay - These 1,265 slides are styled to look like the Coca-Cola branded ScreenPlay slides shown in actual theatres. 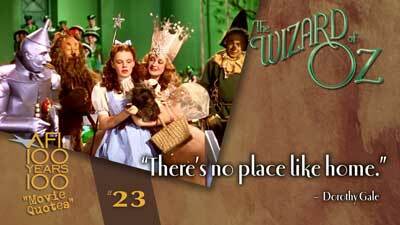 • Oscar winner trivia - Choose the Best Picture winner trivia slides, for films from 1944-2008. • HT SlideVision - Over 2,000 slides from popular movies series' like Star Wars, Pirates of the Caribbean, Alien and more. • Aeon Nox - If you want lots of different types of slides but prefer they all have a matching theme this set of over 1,000 slides is for you. Other ideas: I've also created slides for my personal theatre by using images and ideas created and posted by others around the web. Here are some links to things you might be able to use to make your own slides. Please keep in mind that it's probably OK to use this stuff for your personal use but don't steal it from them and try to pass it off as your own. • This theatre... - I've adapted some of these signs into slides showing the equipment used in the theatre. • Movie clichés: The New York International Latino Film Festival has published some funny infographics of popular movie clichés that make great slides. This page has most of them but do a Google search and you'll find several more. • Victor Hertz: This guy has a ton of great stuff including music and movie pictograms, honest logos, and more. • Star Wars by the numbers: Fun Star Wars math infographics. If you need background images for your slides, Google has you covered! Tons of sites offer images free for personal use. Please note: All images, logos, etc... are copyright their respective owners. These slides are for personal home theatre use only and should not be sold or used in commercial settings.